Hanoi (VNA) – The central provinces of Thua Thien-Hue and Quang Tri are working to ensure the progress of paying compensation covered by Taiwanese Hung Nghiep Formosa Ha Tinh Steel Corporation, which was behind maritime environmental pollution in the four central coastal localities. 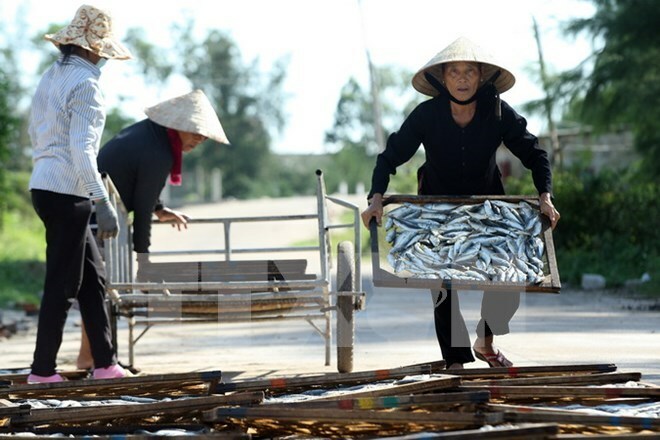 The Ministry of Finance has transferred 3 trillion VND (134 million USD) to the central provinces of Ha Tinh, Quang Binh, Quang Tri and Thua Thien-Hue where fish died en mass due to the environmental pollution in April. The money, part of the 500 million USD compensation paid by Taiwanese Hung Nghiep Formosa Ha Tinh Steel Corporation, was allocated to Quang Binh, 1.1 trillion VND (49.3 million); Ha Tinh, 1 trillion VND (44.8 million); Quang Tri, 500 billion VND (22.4 million), and Thua Thien-Hue, 400 billion VND (17.9 million). The ministry also issued detailed instructions on how to compensate people in each locality. The People’s Committee of Thua Thien – Hue on October 13 decided on the allocation of 400 billion VND to the districts of Phong Dien, Quang Dien, Phu Vang, Phu Loc and Huong Tra town. Accordingly, the above-mentioned localities received 48.17 billion VND (2.16 million USD); 27.9 billion VND (1.25 million USD); 137.16 billion VND (6.17 million USD); 147.25 billion VND (6.62 million USD); and 39.5 billion VND (1.77 million USD), respectively. The People’s Committees of the five localities will advance half of compensation levels for the affected in accordance with the Prime Minister’s Decision No. 1880/QD-TTg on September 29, 2016. Chairman of the Phu Loc District People’s Committee Nguyen Van Manh said the advance payment will be made to all affected people within three to five days upon the announcement of the official eligible lists. Meanwhile, Quang Tri had a working session with officials from the Ministry of Agriculture and Rural Development on the compensation worth 500 billion VND (22.4 million USD). The pollution incident affected 2,659 fishing boats and 4,778 crew members; 824.221 ha of farming fish; 15,934 labourers; and 1,290 tonnes of frozen fish. The provincial People’s Committee suggested relevant ministries and agencies assisting local people to establish long-term livelihoods while continuing monitoring the marine environment to ensure it is safe for breeding and exploitation. In late September, Prime Minister Nguyen Xuan Phuc approved a decision to list seven groups of victims working in affected sectors in the four provinces, including seafood harvesting, aquatic breeding, salt production, coastal seafood business activities, fishing logistics, coastal tourism services and seafood stockpiling and purchase. Compensation ranges from 3.69 million (165 USD) and 37.48 million (1,680 USD) per person each month depending on damage. The mass fish deaths along beaches in the central region were found to be the results of flawed waste and wastewater treatment of Hung Nghiep Formosa Ha Tinh Steel Limited Company.